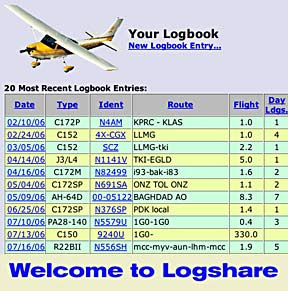 Wes Cobb, who blogs under the name of vfrstudent, has a post up now about a very cool online logbook called Logshare. It is loaded with features that will do everything from output charts and graphs to break down your hours in a zillion different ways, or remind you when your IFR or VFR currency or medical is coming due. I have spent literally hours online in the past couple of years looking for precisely this kind of online logbook. I would have paid money to use it, but Logshare is...free. Don't even ask me how people can put the major-league time and talent into creating this kind of comprehensive site and then give it away, as a website developer myself, this boggles the mind. Tired of whipping out the calculator every time you need to tally up a page in your logbook? Isn't it a pain going back through pages of scribbled logbook entries just to figure out if you're current? Keeping track of your flying is important business for many reasons, and the old-fashioned written logbook isn't very helpful when it comes time to use it productively. LogShare alleviates you of these common issues by using technology to simplify your life as a pilot. Need to know if you're IFR current? Now you're one click away. Want to know how much flying you did this year for business? Again, one click. This powerful application makes it extremely easy to do all this and more. I will most certainly sign up and try really really hard to log my flights and utilize all the power that this site offers. However, I know how screwy the Internets can all be, every last one of them. So I will always keep my paper logbook going too, since that is what the CFI signs off in. Because we all know that the one constant in cyberspace is that there is no constant, and a great website here today might be gone tomorrow. Having said that, I wish Logshare and the people behind it the best. Live long and prosper...it works for me.